Sares Regis Group Acquires 150 Acres in Ontario for 3 million sq. ft. Business Park Project - News - Resources - Allied Commercial Real Estate, Inc. In a pair of major transactions, SARES•REGIS Group acquired 150 acres of prime industrial land on I-10 in Ontario, to develop state-of-the-art LEED certified industrial distribution buildings totaling approximately 3 msf. 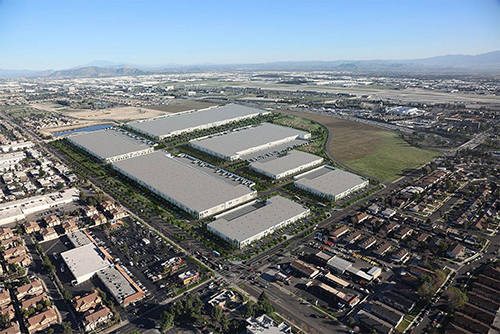 In concert with the land purchase, SRG pre-leased the largest of the seven buildings planned for the site to QVC for the giant video and e-commerce retailer’s first West Coast distribution hub. SRG completed the land purchase with the Meredith family on July 1. As the land purchase was being completed, SRG and QVC executed a lease agreement for QVC’s 1.05 msf building to be completed July 1, 2016. The building will include 30k sf of office and employee cafeteria space. QVC anticipates hiring approximately 1,000 team members in total by 2020 as the distribution center expands fulfillment to all product categories. SRG’s land purchase followed the Ontario City Council’s unanimous approval in April of a new Specific Plan and Development Agreement. In addition to SRG’s industrial project, there are entitlements for 1.1 msf of office and retail space and 800 apartment units on the 80 acres retained by the Meredith family. A family representative said that five acres have been sold for a planned Audi auto dealership and talks are under way with other interested buyers. SRG’s six remaining industrial buildings planned for its 150-acre site are for lease. They range from 130k sf to 575k sf with 32-foot and 36-foot clear heights. SRG’s entire project will be completed by late next year. SRG has developed more than 21 msf of industrial space in the Inland Empire since 1994. SRG was represented in the land acquisition and the QVC lease by Joe McKay, also of Lee & Associates. QVC was represented by CBRE brokers Erik Wanland in Ontario and Mike Barker in Wayne, Penn.